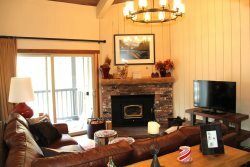 Above Standard One Bedroom and One Bath condominium located walking distance to Canyon Lodge Ski Lift Area in Mammoth Lakes. Sleeps up to 5. 1 King bed in the Bedroom (new mattress Nov.2012), and two twins and a queen foldout couch in the living room. The unit has WIFI, No Phone, 40 inch Flat Screen TV Living Room, VCR, DVD, stereo, 32 inch Flat Screen with Blu Ray Connected in bedroom. Approximate 780 sq. ft. The unit is all on one level and you enter from an interior hallway in the Chamonix C Building. There is one outdoor parking space available. Chamonix Recreation room with large screen TV, reading area, ping pong, Foosball, and business center with fax, copier, computers w/ internet and laptop hook-up. Sauna, hydro spas, seasonal/summer swimming pool & BBQ area. Coin-operated laundry facilities located in the common area near the office. COMPLIMENTARY INTERNET and CABLE TV are provided, however NO REFUNDS will be given for connectivity problems or Internet failure. TOT LICENSE 1968-CX45. Great value. Walk to slopes. Clean. Great communication, everything was exactly as described. Walking distance to the Canyon Lodge, cant get much better in Mammoth. Would recommend. Good price. Clean carpets and good place to stay. Central Reservations responded quickly and was thorough with check-in instructions. Excellent location within easy walking distance to Canyon Lodge. Unit was clean and cozy with all the kitchen equipment you would need to cook at home. The timber fireplace was awesome after a day of skiing. Main bed was a little firm and pull out sofa not overly comfortable. Plenty of towels, easy parking directly out front. The location cant be beat. The unit itself is bare bones but adequate. If you plan on cooking, bring everything you need as there are no cooking supplies (oil, foil, tea, nonstick spray, etc). WiFi was reliable and fast enough for what we needed. The jacuzzi was fantastic--super hot, view of gondola and next to a clean sauna. The rec room had a full implement to play pool, ping pong, foosball, and a nice tv & fireplace area that no one else was using so we had it to ourselves. There were plenty of extra blankets too, fyi. Nice place, convenient location, perfect for family of 4! Great location, very clean, well equipped condo. Renting was easy - we would stay again. Super clean, great location - even tho its an older condo it had everything we needed. Even saw a bear in the parking lot one morning. Worked well for us. Its what we expected for the price. Older condo with some quirks but worked great for us.